PopEntertainment.com: Alyssa Jacey interview 2006. Copyright �2006 PopEntertainment.com. All rights reserved. Posted: April 24, 2006. It�s not easy to break into the music business. 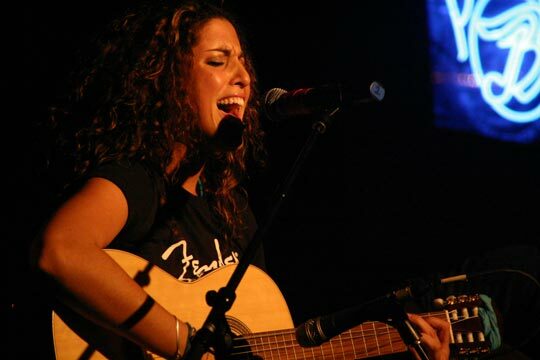 However, only a year into her singing career, Alyssa Jacey is making some serious headway. Taking the opposite direction of most music stories, Jacey has really started to blossom since she moved back home to San Diego after a period spent in Los Angeles. Living in LA, she was determined to be a dancer. She had found some success at it � appearing in videos and the Super Bowl halftime show � but she wasn�t happy with the lifestyle and eventually went home to regroup. It was there that she was convinced that her singing hobby could actually become a career. Jacey threw herself into her music completely and tirelessly. In the past year, she has independently released the EPs Alyssa Jacey and The Soul and the album Closed Eyes Open Heart. 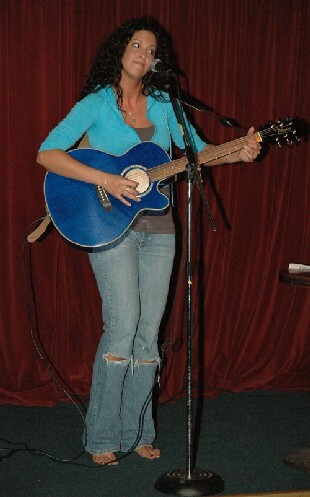 Jacey also co-wrote and recorded a duet on an upcoming album by friend and frequent collaborator Mitch Budd. She has a live album and a full length CD ready to drop in upcoming months. She is also currently scouring the San Diego music scene to put together members of a full-time band. Jacey took a little time out of her Easter Sunday to chat with us about her music and her big plans. You started out in choreography and dancing, and moved to LA to try and become a dancer. You had some success, doing music videos, even the Super Bowl halftime show. Yet I saw in an interview where you said that was a real low point in your life. Why do you feel that? You know, when I moved to LA, I had really high expectations. [However,] I�d heard rumors about the city sucking you in and whatnot and [eventually] I just realized how hard it was to actually make it in any way. Not even as a dancer or a singer but as anything. I was working a job as a hostess. I was also working a job as a cocktail waitress. I was also teaching dance. All of those things � sort of made it difficult for me to just live. I was struggling. I had to ask my family for money to help me out. That made it difficult because I hate doing that. I don�t do that. How did you decide to move over to the singing side of the business? I started when I was cocktailing there. The place that I worked at, called Gotham Hall, they had karaoke every Wednesday night. My friends had heard me in the car singing to myself and they kind of mentioned to maybe follow it. But I was like, oh you guys are silly. I want to be a dancer, I can�t sing. And [then] my job was like, �hey listen, why don�t you try a song for us tonight.� They kind of really had to push me, because I was never into karaoke (laughs). I�d never gotten up and sang before anyone before. So I started doing that and from the first Wednesday the entire restaurant � people that I worked with � were like, �okay, you have to do this every Wednesday night.� After karaoke, it was all beautiful from there. As soon as I moved home from LA, I started doing karaoke here in San Diego and I would be approached after songs that I�d sing � if I was professional, did I have CDs? Where can they see me sing again? So finally I was like, that�s it, I have to do something about it. So, I kind of made the decision. As a dancer you worked mostly in hip-hop, but musically you tend to be more folk, rock and soul areas. Was this the sound you have always really been into? I don�t really agree with that, actually, folk rock. I�ve always been into the kind of music I�m singing now, but when I began I was so confused about what genre I wanted to go for, because people are hearing me said I sounded like I was doing country. I sounded like I was doing pop. I was doing soul. Bluesy. I was like, oh my gosh, what genre am I going to be? Because I know no label is going to sign me if I�m, you know, eight different genres� (laughs) So when I started, my first two recordings, the Alyssa Jacey EP and Closed Eyes Open Heart, those tend to be more towards the pop-country vibe. After I started teaching myself guitar six months ago, I changed. My voice has grown and I changed my style of music. Now, I�m definitely, I call it pop soul. As well as the choreography, you have done some work as an actress and model. How do you think all these experiences help you as a performer? Are you going to continue acting and dancing as well as doing your music? To answer your first question about if it�s helped me � definitely. I�ve been on stage dancing since I was four and a half. I�ve been modeling since I was about six. I�ve been acting since probably junior high school. All the way through high school and through college. So, all those things I�ve been doing up until I started my singing career � I really did make the decision to stop doing everything else other than school and just go 110% into my music career. I�m really glad I did that, because it�s really showing. That I put so much time and effort into it. Showing improvement. I�m getting a lot of good feedback. I feel like my career has grown a lot faster than any typical career would, because I�ve been able to put so much time and effort into it. Your CD and EPs were all independently released. Do you want to eventually sign with a major label or would you like to try and make it as an indie artist like Ani DiFranco? I have been putting in some thought about it lately. I haven�t fully decided about that, but I�m the kind of person that always wants to reach for the stars and keep reaching beyond them. A major record label is definitely what I�m aiming for. Not to say I would be upset if I did end up signing with an indie, but I�m aiming for major. 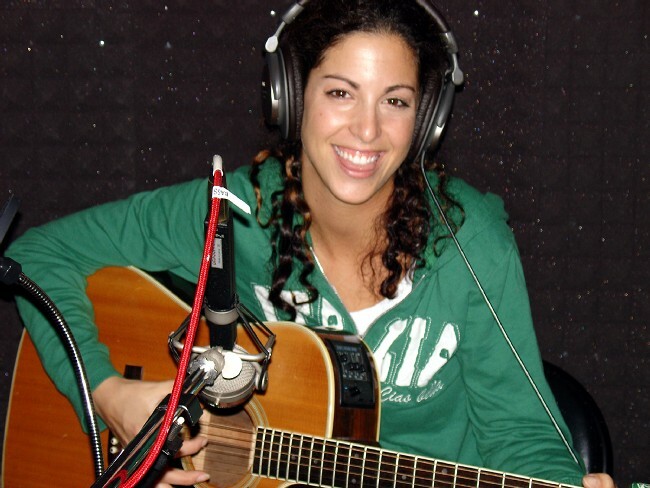 You have an old friend, Tristan Prettyman, who released a major label album in the past year. Did her success help inspire you that it is possible? Oh definitely. It made it more than obvious that � you know, she and I went to high school together and she played a lot of the same venues that I�m playing now and seeing her success definitely does show � she made it and others can make it, you just have to put your heart and soul into it and you can do it. I really like �Understand?� It seems particularly trenchant these days with the lack of tolerance in the world. Do you think a song can help people to recognize that the problems and the bigger pictures in life? �Beer and Wine� is about the dangers of drinking and driving. Was there a particular situation that happened to you that made you want to write that song? Yes. When I was living in LA I was in the car while my friend was being pulled over. She ended up getting a DUI. She and I are best friends and we did everything together and I decided to go support her at a Mothers Against Drunk Driving talk. I heard this black mother speak about her children who had been killed in a drunk driving accident. I went straight to work and I just started writing and this song came out of me in about ten minutes. In your songs, when the songs turn to love, the songs tended to be about relationships that were in trouble like �Prove Me Wrong,� �How Did You Say Goodbye?� and �Love and Hate.� And yet others like �Sunset Blue� and �The Longest Kiss� are happier. As a songwriter, do you find troubled relationships more interesting than happy ones? I wouldn�t use the word interesting. I would use easier to write about and more inspiring. Because, you know, happy relationships � yeah, you want to write about them. But I feel I�m more of an emotional writer and the stronger emotion comes from � I guess you could use the word troubled or hurtful or whatever is going on. Miscommunication or whatnot. It is a little easier for me to connect with it I guess with relationships that aren�t going as well as the ones that are. In �The Longest Kiss,� there was a line you wrote that kind of stood out to me. You say �The longer we wait, the more time we waste.� Does that line sort of reflect the way you feel and live your life? Definitely. 100%. We�re on this Earth for such a short amount of time. I really hope that everyone can find their passion as I have. It�s exactly how I live my life. The longer you wait, the more time you waste. I�m thinking the longer I would wait, for example about putting off this interview until next week � no, I want to do it today! I would put anything aside to do whatever it takes to get to where I want to go. Which of your songs do you feel says the most about you? Hmmm� (laughs) Okay I like this question. Says the most about me. I haven�t written a song that is actually me. It�s been me in situations, like �Beer and Wine� or �The Longest Kiss,� in a relationship. You know, I can�t even answer that. I don�t know. They all have a piece of me. I�m connected in all of them in such a way that I can�t really choose one. 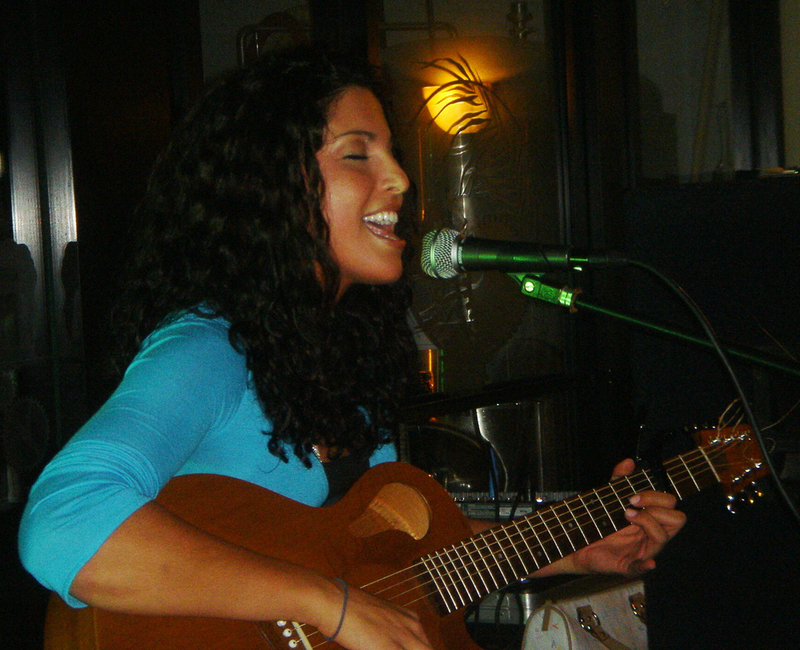 You�ve been singing for a long time, but you�ve just recently learned to play the guitar. How hard was that to pick up? This is what I tell people, because they�re shocked when they see me out playing guitar and I�ve only been playing for a certain amount of time. I played my first forty minute show at Canes in San Diego by myself after just three months of playing. I really, truly believe that if anyone has the time that I had to put into playing guitar, if they�ve got the rhythm background, or whatever they�re going through to be a musician � you can do it. Anyone can do it if they put their mind to it and don�t put it off. It was hard at first, but I was so dedicated and so inspired and ready to take over because this is my career and I want to do it. So I forced myself and it turned out to be so much fun. It just comes easier and easier the more I practice. I�ve seen in a few of the articles you are referred to as determined and motivated, and I certainly know that firsthand. As someone just starting out do you feel like you have to work that much harder just to get noticed? I definitely think so. I think any suggestion that � people are asking me, �how are you this far along? You�ve been singing for a little over a year now. Your guitar is six months. How are you getting articles written and all this press and all these shows?� Really, all it is is exactly what the hype is all about. You have to be ambitious. Never let anyone tell you that you can�t do it. Because I have been told that before. I just can�t listen to anyone else. I like some of the covers you do in concert and have on your site, like �You Were Meant For Me,� �Give Me One Reason� and �Time After Time.� What makes you choose a song to cover? What are some other songs you perform by other artists? At first, when I first started singing, I thought the covers that I did would just be best suited for my voice. So, my first cover song � the first song I sang at karaoke at Wednesday night in LA was �Life Goes On� by Leann Rimes. Again, back then I was pop-country interested. So I would do that pop-country song. Then �Time After Time,� Cyndi Lauper has a beautiful voice. That song is timeless. I wanted to do covers that people also could maybe sing back with me, because I�m all about connecting with the audience. I like that a lot, having people be able to sing back to me. Nowadays musicians have so many more ways to reach out to their fans, your official site, your MySpace page, your guestbook. What is it like being able to communicate with the fans like that? Incredible. MySpace is one of the best things that has happened to me as an artist. I get contacted by people all over the United States. All over the world. I mean, Canada and Japan� I�m getting emails from them saying they love my music. The person in Canada bought my CD. It�s a great way to reach out to fans across the world and get their opinions. I mean it�s crazy to hear the kind of opinions � not too different from California but people you do hear from across the world, they tend to choose different songs than people here and I like that. It�s interesting. As real. My lyrics are not made up. They come straight from my heart. The main thing that I want people to look at in my music is not my voice and it�s not the music itself, it�s the lyrics. I really, really love to write and I really look up to people, other artists who can write. So I want people to look at the lyrics the most. CLICK HERE TO SEE WHAT ALYSSA JACEY HAD TO SAY TO US IN 2010! #1 � 2005 Chad Martin. Courtesy of alyssajacey.com. All rights reserved. #2 � 2005 Chad Martin. Courtesy of alyssajacey.com. All rights reserved. #3 � 2006 DMT3 Productions. Courtesy of alyssajacey.com. All rights reserved. #4 � 2006 Paul Kim. Courtesy of alyssajacey.com. All rights reserved. #5 � 2006 Mark McClellan. Courtesy of alyssajacey.com. All rights reserved.